Most licenses have ongoing requirements that must be met to keep the license active and in good standing. The most common requirement is a renewal of the license which may be due annually or every set number of years, depending on the license. A license renewal can be as simple as paying an annual fee, or as complex as submitting detailed financial information, bonds, or paperwork. When a renewal is late, it can result in penalty fees or worse. In some cases, if a filing is even ONE DAY late, the license is considered expired and the business must halt operations. Businesses may need to go through the initial application process again to get back in good standing. Late or missed filings can cause serious interruptions in business, late fees and other penalties. State regulatory agencies take great steps to identify and penalize unlicensed business operations. In many cases a late renewal will trigger action by the agency. Any business operating without a license, or with an expired license, may be subject to penalties, such as harsh fines and/or cease-and-desist orders. Some agencies will permanently revoke a license for egregious behavior. Other agencies will force businesses to return all profits that were collected during the unlicensed period. 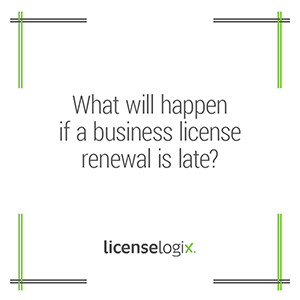 LicenseLogix's ongoing compliance tool CLiC will ensure that your business files every renewal on time. For additional help you can fill in the form on the right or give us a call at (800) 292-0909.